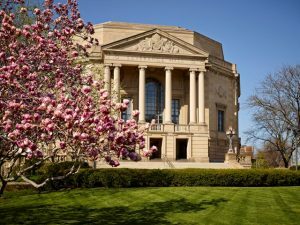 The Cleveland Orchestra is seeking a recent college graduate to join the Communications / Public Relations (PR) team this summer as the Media Relations Intern. This compelling storyteller with a passion for music will help to create compelling narratives about the power of music and inspiring artistry of The Cleveland Orchestra, with a central focus on the Orchestra’s mission to present extraordinary musical experiences for the people of Northeast Ohio and the world. This individual will support the Communications / PR staff by assisting with PR activities, including traditional external media (radio, television, and print), internally-generated digital media (social media), and photography and videography. Tasks may include monitoring, cataloguing, and circulating media mentions and news clips; writing and generating content for social media and press materials; organizing photo and video assets; and analyzing social media statistics and trends. This full-time summer position will work primarily on communications, media relations, and social media for the Blossom Music Festival and Summers@Severance seasons, and the annual Star-Spangled Spectacular. Bachelor’s Degree in communications, public relations, English, writing, journalism, marketing, arts administration, music, or related field. Similar previous work experience or internships in the performing arts or non-profit organizations. Ability to think strategically and proactively offer solutions. Strong attention to detail, organizational skills, and ability to achieve deadlines. Excellent interpersonal, written, and oral communications. Ability to work well with a variety of people, calmly, efficiently and independently in a fast-paced, dynamic and collaborative environment while managing multiple projects and deadlines. Ability to handle confidential and/or sensitive situations with diplomacy and tact. Demonstrated proficiency in computer software programs, especially the Microsoft Office Suite, and social media platforms (especially Facebook, Twitter, Instagram and YouTube); experience with Adobe Create Suite (Photoshop, InDesign) would be an asset. Ability to work a flexible schedule that includes evenings, weekends, and some holidays. Ability to travel locally and to Blossom Music Center on some weekends is required. Photography, videography, and digital photo/video software skills preferred. Knowledge of classical music preferred.